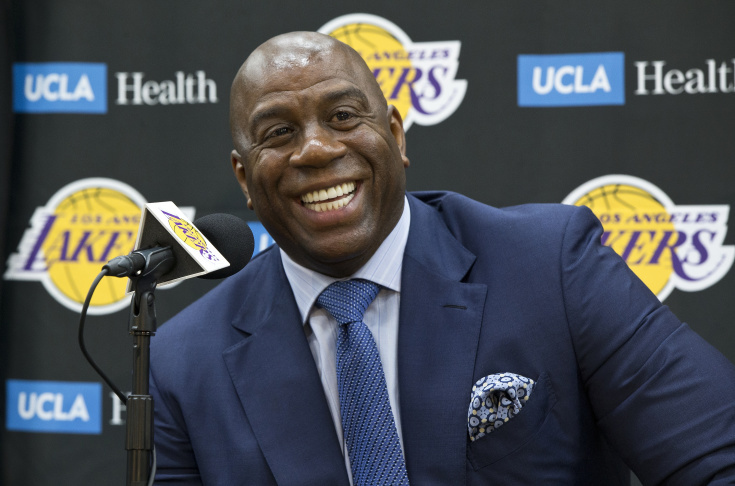 Magic Johnson surprised reporters Tuesday when he announced plans to step down as president of basketball operations for the Lakers. He's had the job since February 2017. "You think about where you are in life, what's important to you," he said to the cameras at the impromptu Staples Center news conference. "And what's important to me is, I get to help everybody within the Lakers. And now with the fines and tampering and this and that, I can't help young men the way I need to help them." "I like to be free," he said. "What am I doing, you know I have a beautiful life, so I'm gonna go back to that beautiful life." Magic Johnson says that his position doesn't allow him to be a statesman of the game of basketball. He says he wants to go back to his wonderful life away from this position. "I was happier when I wasn't the president (of the Lakers)"
The Lakers have been struggling for a while now, despite big efforts to reshape them as a championship team. They haven't made the playoffs since 2013. According to stats from the NBA, the team had the 5th worst winning percentage in the Western Conference (.422) while Johnson was president. "I'm a free bird, and I can't be handcuffed," he said. "This is a good day."